Photo by Laurie Ward. Pups exploring the world, learning confidence. And while you’re at it take a look back at our previous blog post The Puppy Play Ground (simply click this link) for a look at Debbie Slaski Bjerkstrand‘s puppy play ground Mark built for their Gordon Setter babies. 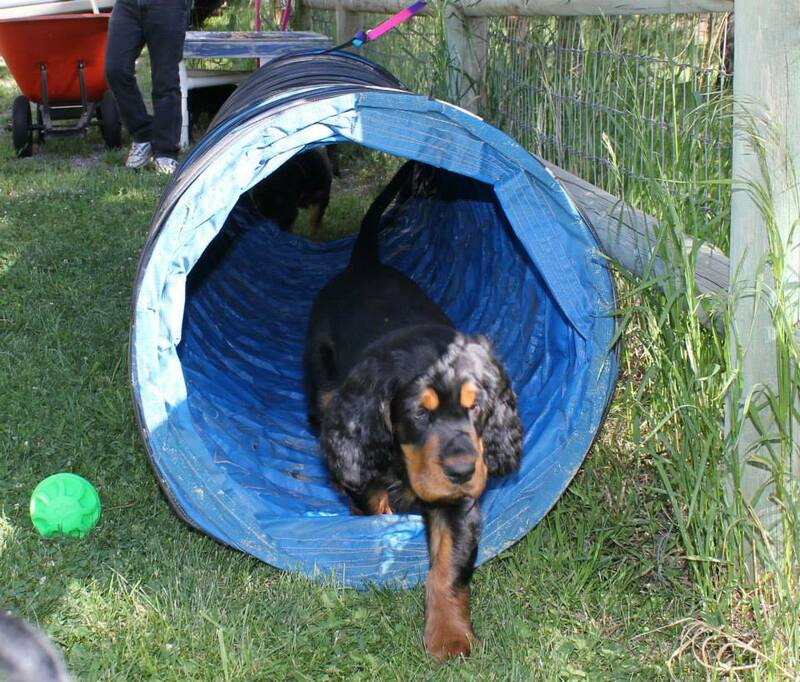 Thank you so much Debbie for demonstrating how Gordon Setter breeders do it right! Here is a great video of her Gordon Setter pups at play in the yard, learning to be brave! Here she takes the young litter outside for some new experiences. Here is Laurie Ward’s litter rushing down the steps as they’ve already learned how to explore the great outdoors…brave kids! And they ask us why our puppies cost so much? Raising Puppies to Be Brave: The Top 10 Ways to Create Confident Dogs – Avidog. Paul F. Doherty – Our breeder is a school teacher and when each new litter reaches 7 weeks, she brings then to school and has all the children sit in a circle letting all the puppies into the middle. The children can grab, pull, pet and touch all the puppies helping to socialize them at a very early age. This was done with our Gordons Chester & Cooper and as a result, they are great with everyone…especially children! Joanne Altman – Loved the article! Carolyn Pearce – When I have puppies, they become my life for 8+ weeks and I love every minute of it. I spend as much time as possible with them and encourage as many people to do likewise. It is such fun to have puppies, hard work but fun. Pat Boldt – Sally thanks for taking the time to post articles. Lots of good ones! Beverly Garaux – Love your articles. Here is a great question posted by one of our Facebook readers. What is the opinion out there, post your comments so we can discuss here! Great article….but….I always hate to see breeders letting their young pups go up/down stairs!!!! It makes me cringe. It’s SO bad for their growing/sensitive joints, from everything I’ve read and heard. I thought you should ALWAYS avoid steps and slippery floors, for proper development, -ie. to help prevent developing hip dysplasia. Do you agree?? Slippery yes, steps no. Puppies will encounter steps in their lives and teaching them to navigate safely seems like something I want. I’ll investigate more and ad a note if needed.